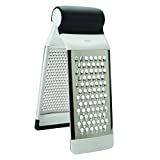 The OXO Good Grips Two-Fold Grater offers convenient grating versatility in one tool, tackling both medium and coarse grating tasks, over a cutting board or directly into a bowl. Its unique bi-fold design allows it to stand upright on a cutting board or the two grating surfaces can be separated for individual use right over a bowl. The medium grating surface is ideal for vegetables, hard cheeses, carrots, zucchini, chocolate and more. The coarse grating surface is ideal for semi-soft cheeses, butter, apples, cabbages, potatoes, onions and more. Soft, comfortable, non-slip handles ensure a secure grip in your hand during repetitive grating motions and the non-slip feet keep the Grater in place on any surface. The Grater disassembles for easy cleaning and folds flat for convenient storage.